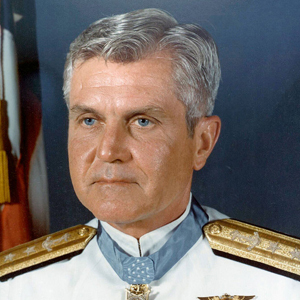 James Bond Stockdale (December 23, 1923 – July 5, 2005) was a United States Navy vice admiral and one of the most-decorated officers who had been awarded the Medal of Honor in the history of the U.S. Navy. Stockdale was the highest-ranking naval officer held as a prisoner of war in the Vietnam War. He had led aerial attacks from the carrier USS Ticonderoga (CVA-14) during the 1964 Gulf of Tonkin Incident. On his next deployment, while Commander of Carrier Air Wing 16 aboard the carrier USS Oriskany (CV-34), he was shot down in North Vietnam on September 9, 1965. During the late 1970s, he served as President of the Naval War College. Stockdale was candidate for Vice President of the United States in the 1992 presidential election, on Ross Perot’s independent ticket.